When searching for a Halloween costume, you will come across a lot that have complicated makeup and outfits. These costumes can be difficult to get hold of or you may have to make them yourself, both of which cost money. What if you could create a Halloween look where the focus was on the makeup? 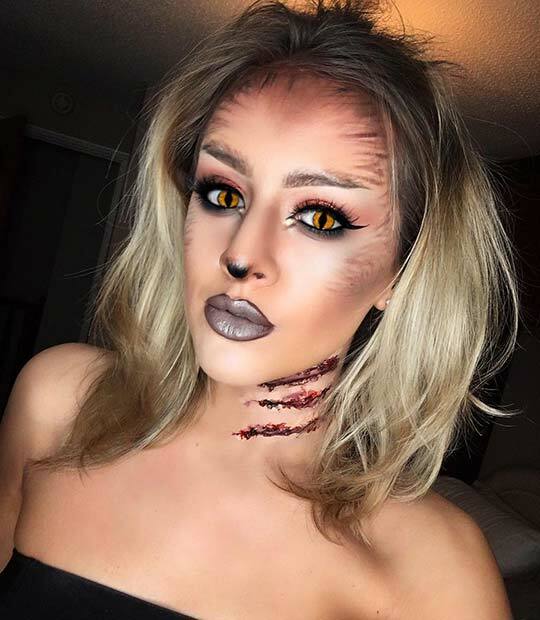 That is why we have found 23 easy Halloween costumes that only use makeup. 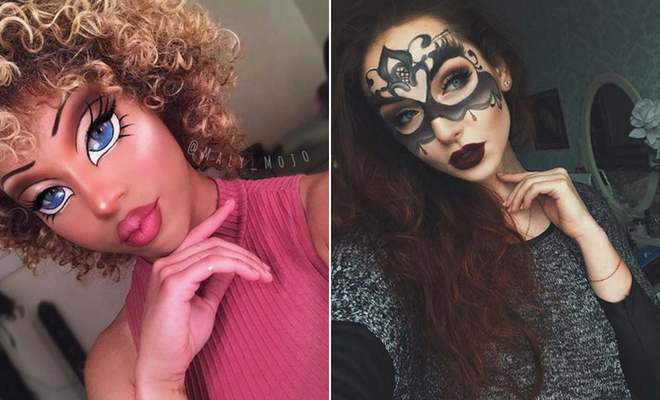 So, you can recreate these makeup looks and not really have to worry about your outfit. You can wear almost anything. Take a look, we have makeup for everyone, including skeletons, scarecrows, clowns and more. 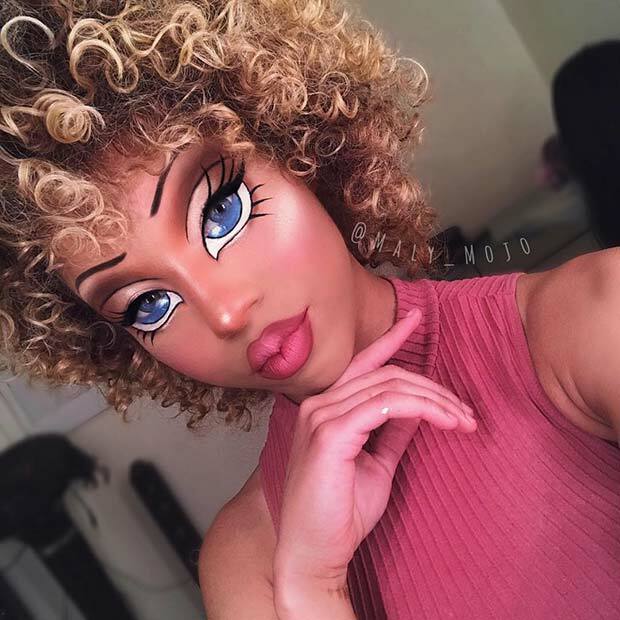 The first idea we have is this doll illusion makeup. This design isn’t like the classic scary doll but more like a fashion Bratz doll. You can recreate something like this or take inspiration from other dolls like the Monster High dolls which have a similar face but are spookier for Halloween. Next, we have a super creative makeup idea. This one features a comic book style Wonder Woman. 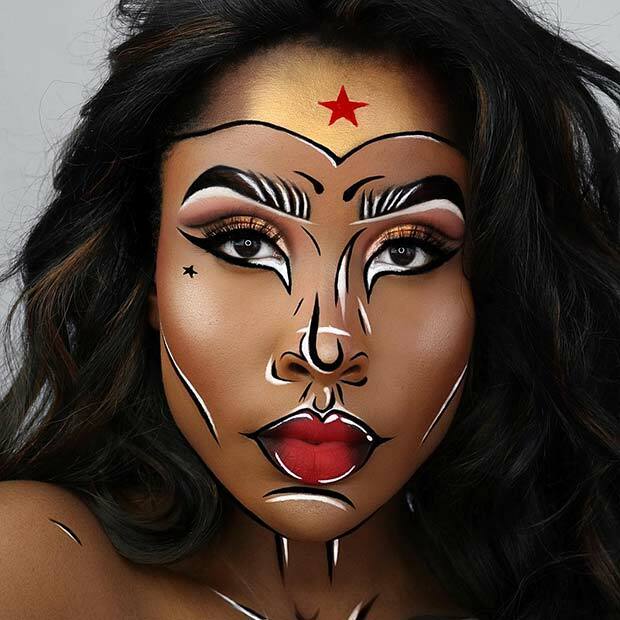 There are lots of tutorials online to help you recreate the look and you can find a list of the products used on the featured artist’s page. Wonder Woman’s outfit has had a lot of changes over the years so just concentrate on the makeup and wear a red top with a blue skirt, shorts or pants for an easy look. Our next idea is a mystical fortune teller. 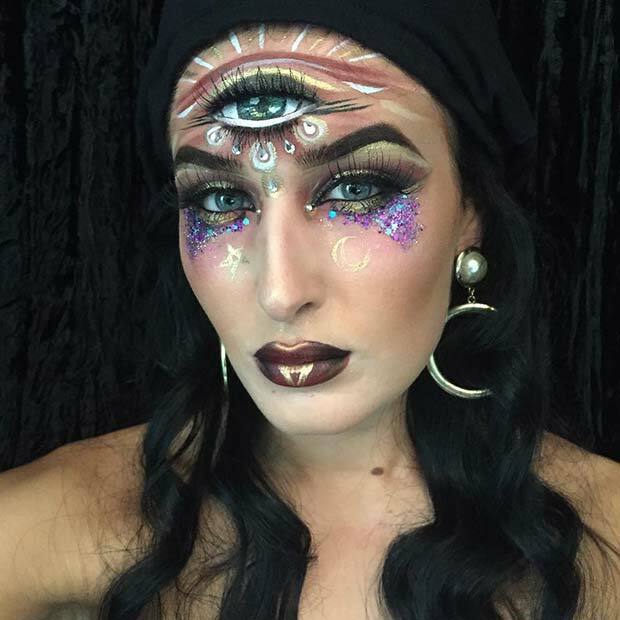 The artist has created very detailed makeup with the third eye but you can just take inspiration from the rest of the look if the third eye is too difficult. So, try the dark lips, bold eye makeup and glitter. Pair with statement earrings, black scarf and a black dress and you’re good to go. Half makeup is a great choice for Halloween as you get two looks in one. Here is a brilliant example. 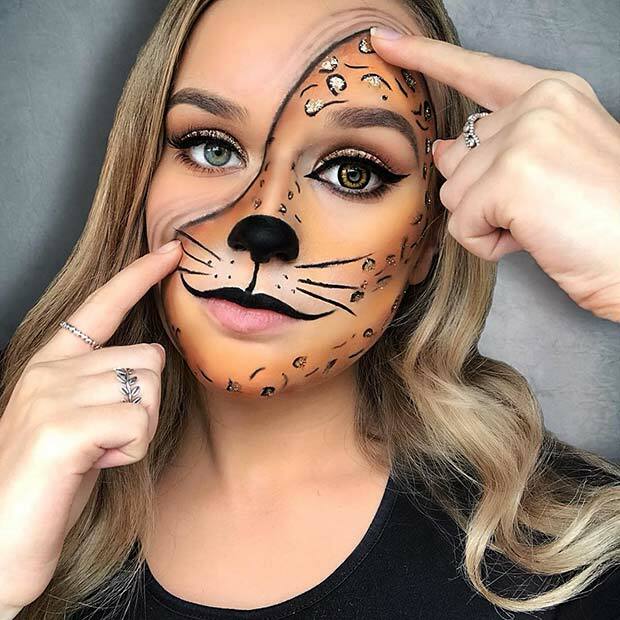 One side of the face features pretty makeup while the other has a glam leopard design. This is such a fun and cute idea. Recreate a sparkly leopard or maybe try something spookier. Either way, try to wear one contact lens because, as you can see, it finishes off the look perfectly. Skull makeup will instantly make you look ready for Halloween. It doesn’t matter what you wear with skull makeup as you will look spooky and ready to celebrate. This artist has created an awesome skull design with glitter. There are tons of tutorials online to help you achieve a look similar to this one. Makeup like this is great for any last minute Halloween costumes. Next, we have a unique version of the Bride of Frankenstein. 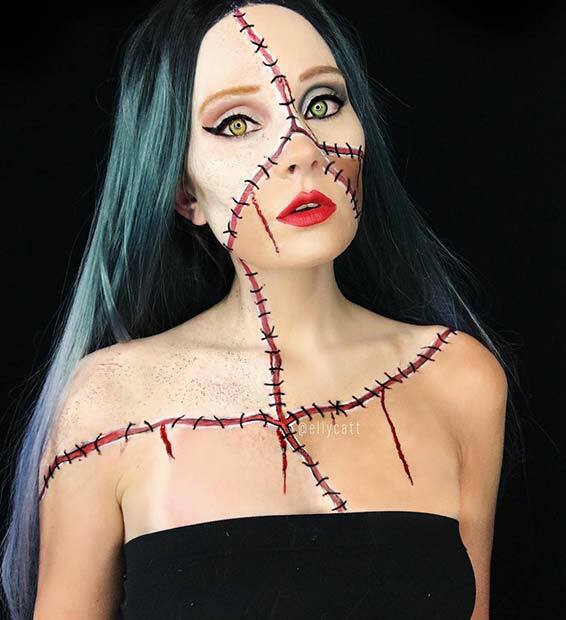 The artist has used the classic Frankenstein stitches but changed up the hair and makeup. Instead of the large hair, she has sleek, long hair and she also has different eye colors too. Makeup like this would look great for a party. There are lots of tutorials to help you create different stitched looks. We couldn’t have a makeup list without featuring a scarecrow which is a Halloween classic. 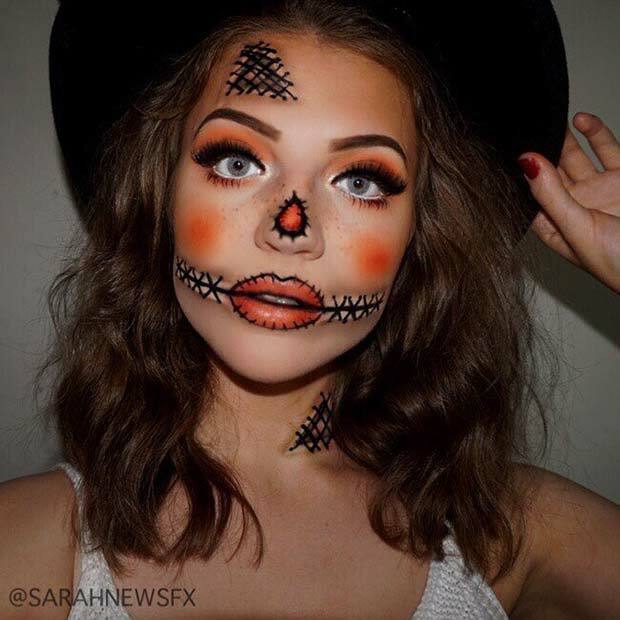 This scarecrow makeup look features pretty eye makeup with stitches and a patched nose and mouth. It is a cute design that is quite simple to recreate. Take inspiration from this or make it scarier by using darker colors. 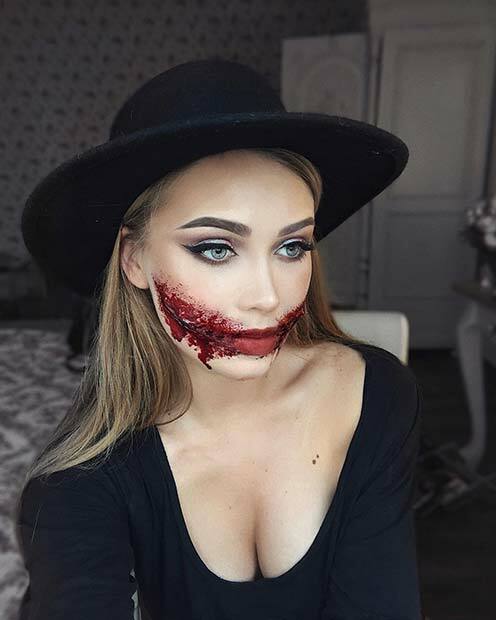 Looking for Halloween costumes and makeup that is more gruesome and scary? Then this pick is for you. Here we have a slit mouth idea. There are lots of different tutorials online to help you achieve this gory design. You don’t really need anything else with this, but you can use dark eye makeup to finish off the look. Our next idea is a scary clown. 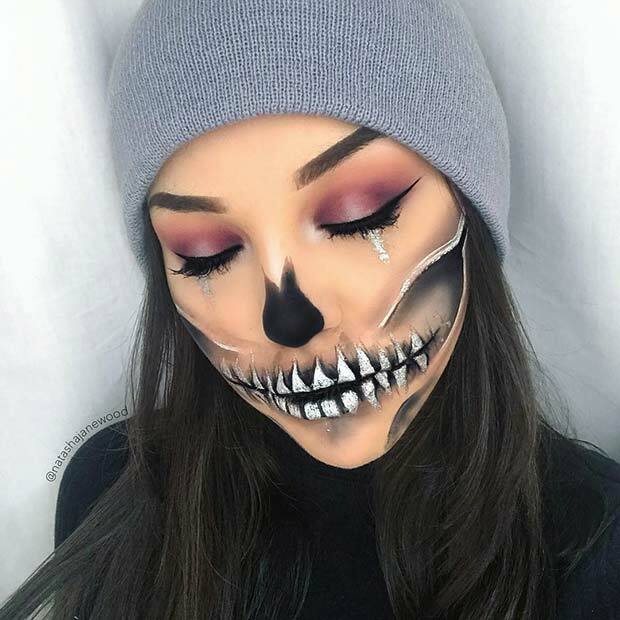 This makeup is quite simple but very spooky. 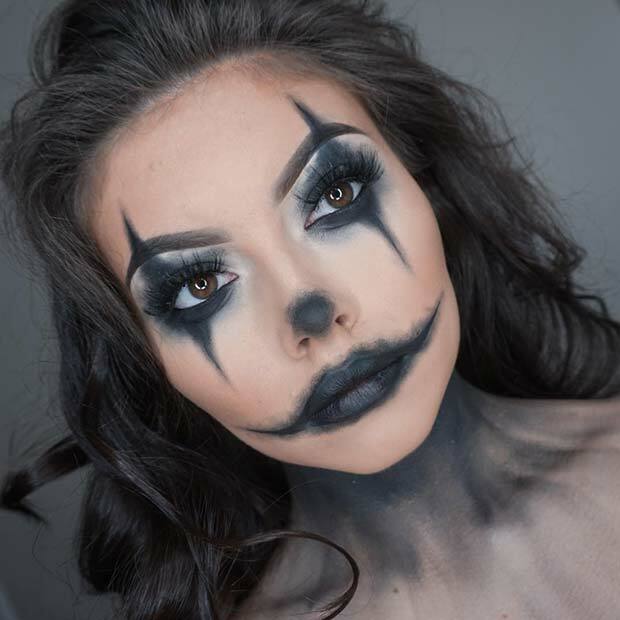 The artist has just used black smudged makeup to create the classic clown features. Wear with any outfit, but a black dress would be perfect. You can also add contacts or other colors to your makeup too. Makeup like this is perfect for Halloween costumes that are needed in a rush. You will be able to make that unexpected party just in time. Next, we have another Halloween classic. This one features a werewolf. The artist has created a furry effect with brown makeup and has also created red bloody claw marks. She has finished off the look with contact lenses. This makeup would be an amazing choice for a Halloween party.